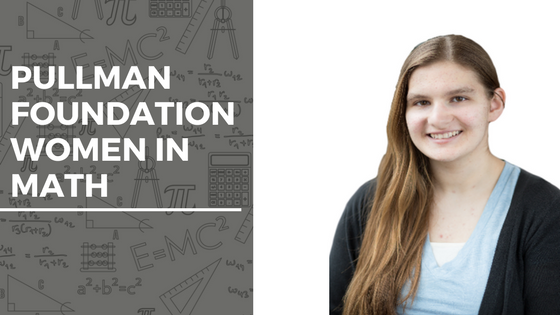 Pullman Scholar Sarah Dickey, Elmhurst College, ’20, shares her absolute love of her major, Math! Math classes were my favorite thing in high school, and equations and graphs always made sense. So to me, it was obvious to pursue a degree based in my interests and in what made sense to me: Mathematics. Even though I’m only a freshman, I’m already involved in the Math community, and I absolutely love it. The experiences I have had in my Math classes alone have been wonderful. Last semester in my Calculus 2 class, I found friendship in many of the other women Math majors. We formed a study group with a few others and it made me feel at home. While my class was split pretty even between guys and women last semester, my current class is all female except for one guy. Even the professor is a woman. And I’ve got to say, I love my professor. She is really amazing and knows what she is talking about and was incredibly excited to see so many women in her class. It honestly makes me happy, too. The amount of people who look surprised or scoff at me when I tell them I am a Mathematics major is too many to count. I don’t want to be asked, “Wow, that’s really hard. Are you sure you want to do that?” I want to be encouraged and accepted for my passion, and I think the world is slowly on the way to believing that. Because I’m a STEM major, I have the opportunity to be involved with an on-campus organization called KEYSTONE. Through this program, I have the option of taking different classes, as well as participating and applying for some really cool things. So far, I have taken two of these classes. One was a freshman-year-seminar based on Math, and the other was a freshman research class. For the research class, I was able to conduct an independent psychology experiment with a small group of students. While I worked on much of it, I was enthralled to be working with the data and all the stats that were collected. Not only was this a valuable experience, but I got to present my research at an honors undergraduate research conference last month. I was also able to get a job working with a faculty member from the Mathematics department to help with their own research over the summer. These opportunities have made my love of Math grow deeper because the more I get involved and understand, the more I want to know. It seems like Math will be a never-ending learning process, and I can’t wait for the journey to continue throughout the rest of my life. I’m absolutely in love with the subject that I’m studying, and it has been incredibly rewarding to advance my knowledge and broaden my perspective on Math. I recommend others to try this path as well, even if it’s only for one class. It has made my life so much better, and I want others to know that it’s a possibility, too.